When my husband and I were house shopping, I was adamant at having at least 4 bedrooms so that one of them could be converted to my closet room. This room is unfortunately on the opposite side of the house from the master bedroom, but the size worked out well. 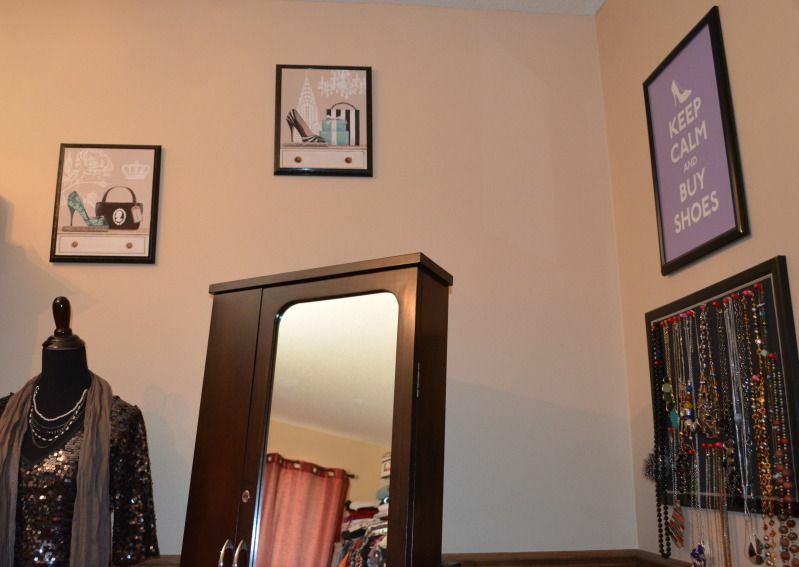 It's longer and narrower than a typical bedroom, which made the most sense for my closet room. I did this all by myself, with the help of the husband. 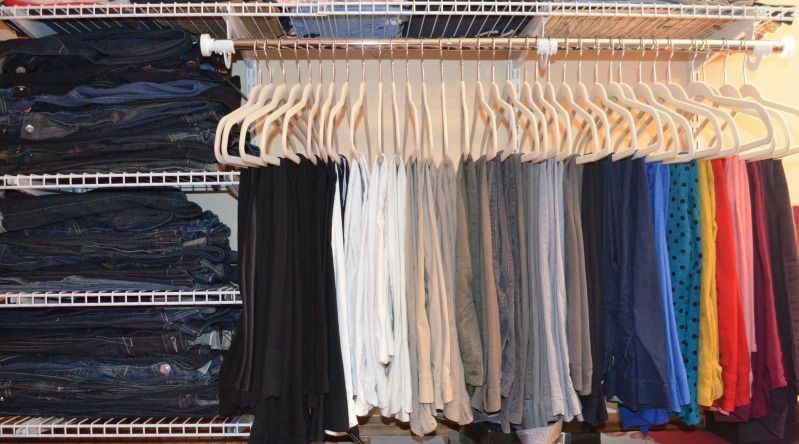 One of these days, I will do a remodel with professional closet folks to do this the right way, but for now, I don't think this is a bad start at all! The shelves were all bought at Home Depot and Lowes. I wanted to maximize the wall space in the room by taking the shelves as high as possible, hence the step stool. 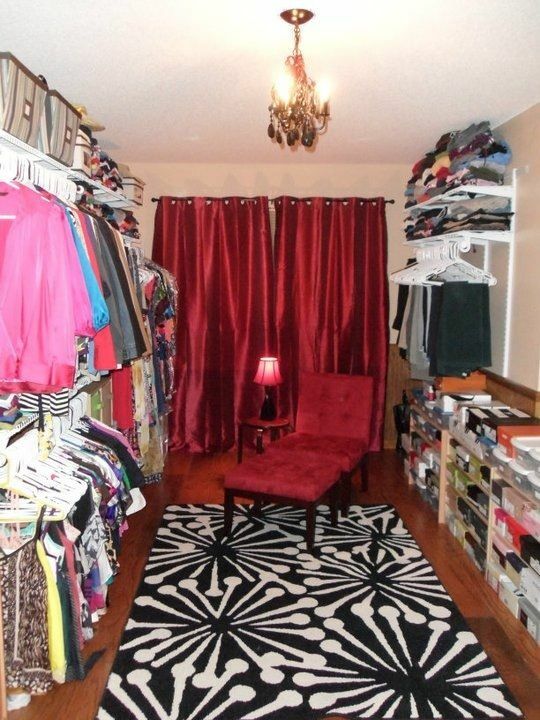 Tops, skirts, and dresses are on the left side of the room as you enter. Below the skirts are some cubbies that hold things like socks, scarves, belts. To the far right of the dresses in the corner are stacked plastic drawers that hold all of my cardigans. I'm very much into patterns and prints, so while you can't tell with the tops and dresses, everything hanging is color coordinated. I have them sorted by type then color - so, for example, the tops are sorted by sleeve length then color. Shoes and pants are on the opposite wall. I've photographed each pair of shoes and placed its photo on the outside of the boxes. At one point in my life, I had all my shoes stored in plastic boxes, however, I heard somewhere that leather cannot breathe in plastic, so if you are going to store them in boxes, it's best to leave them in their original boxes. Some people have asked why I don't leave them out of their boxes. Well, for one, shelving space is limited, and until I get a better solution (aka a remodel), they're easier to stack in the boxes. Second, imagine having to dust one hundred pairs of shoes. In the ideal world, I'd have glass cabinets I can store my shoes in so that I can see them, but keep them protected from the elements. Again, shoes are organized by color and type. 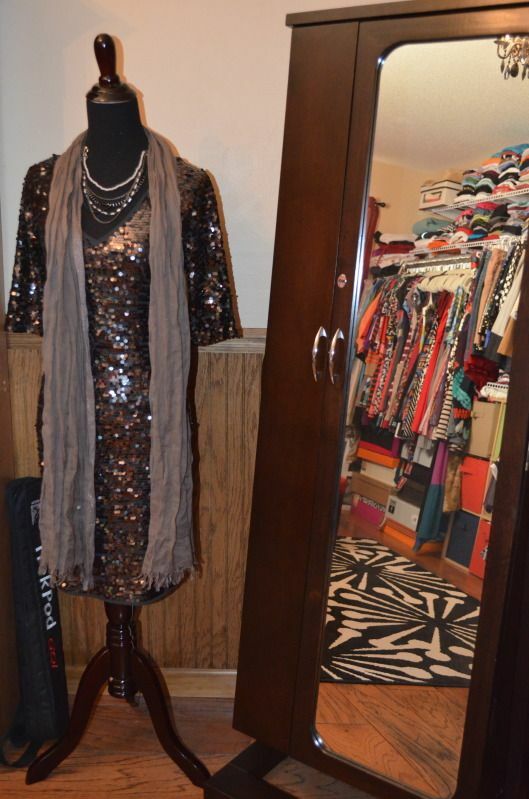 I have a jewelry armoire that I use as my full length mirror, and also a dress form that I like to showcase outfits on. I also added a "little black dress" that I hang on the outside of my closet room closet door (yes my closet has a closet) for chunky jewelry. I found a black cork board from Target along with red push pins that I have some of my longer necklaces on. 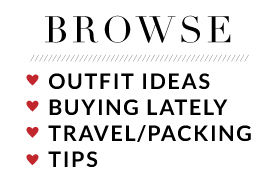 It helps keep the inside of my armoire from getting cluttered and tangled. I found a red chair and ottoman on clearance at a local furniture store. Needless to say, my favorite color is red. 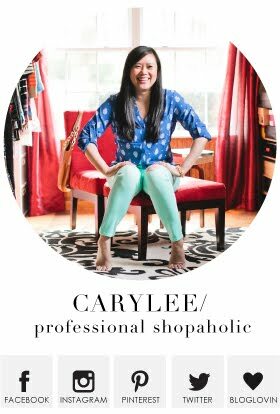 The curtain, lamp, stool (used as a side table), and rug are all from Target. 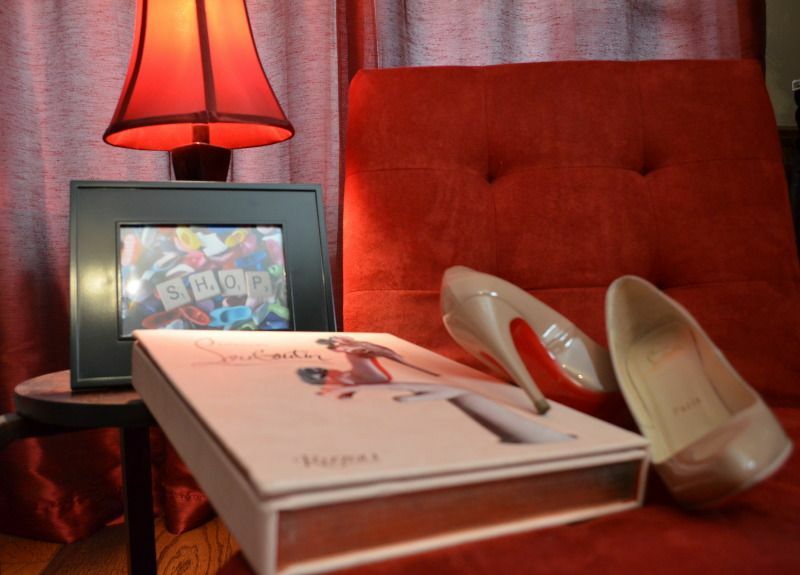 The Christian Louboutin coffee table book is a much treasured gift from a friend. 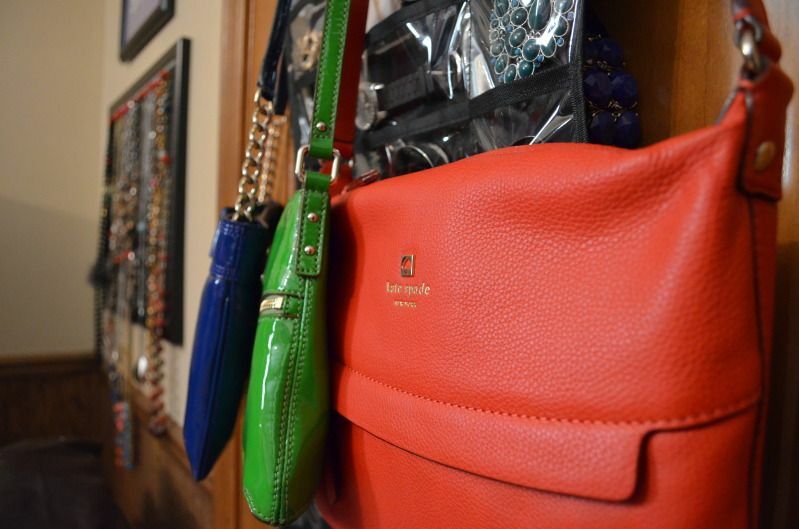 I have a few pieces of shopping related art sprinkled throughout the room. This particular piece below I found on Etsy - Scrabble letters that spell "Shop" in a sea of Barbie shoes. The chandelier I ordered online through Kohl's. It's still available here. I would love to add track lighting one day to supplement what I already have. And that's it! This view is the best view. I walk in and just say, ahhh. Edited on May 25, 2013: The closet room has had a minor reno! Check it out here. 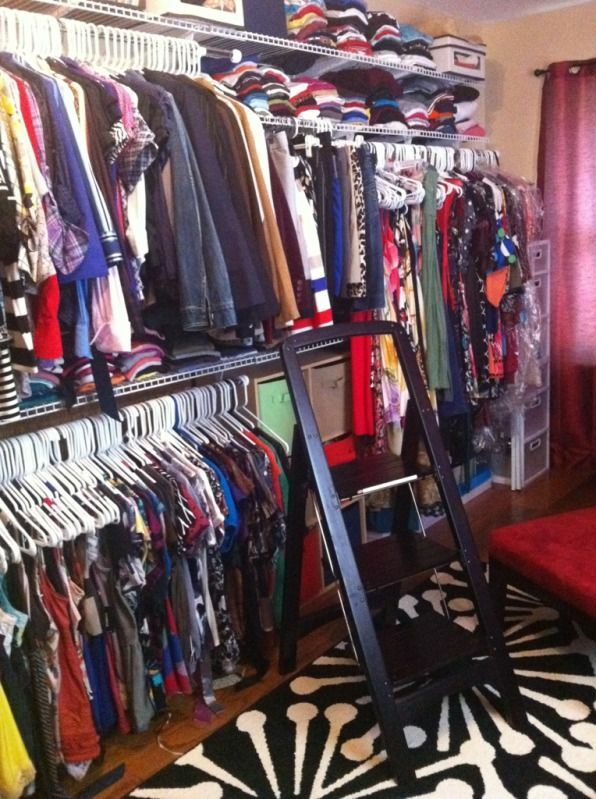 OBSESSEDDDDD with your closet room!!!!! Yay I'm so happy you have a real blog now! I love it!